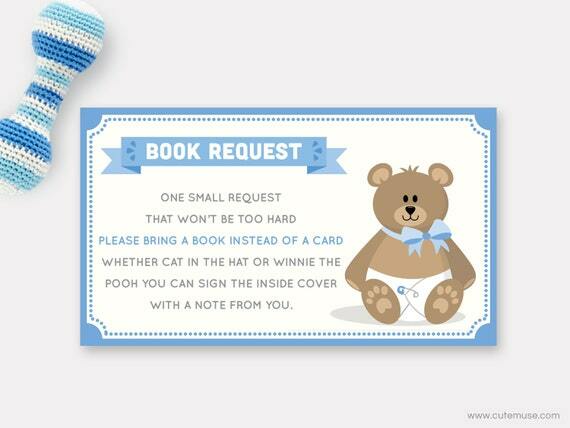 This Teddy Bear Book Request Printable Card is perfect for a "Teddy Bear Theme Baby Shower" for baby boys. This design features a cute baby stuffed bear with his blue bow. The back of this card is a blue baby bear paw pattern on ivory background. *** This is an Instant Download, a non-editable PDF. You will receive it in your email immediately after purchase. - FIRST PDF: Please open this FIRST, inside of it, it is the "PASSWORD and INSTRUCTIONS". • 1st page: 12 Book Request Cards on a 8.5" x 11" page. - Size: The book request cards are 3,5" x 2" / the same size as business cards. • 2nd page: The backside for the Book Request Cards. - Both templates will print 1 per 8.5" x 11" page. This PRODUCT is available as shown. No COLORS, FONTS AND LAYOUT modifications are included when you purchase. Any modifications to the colors, font and layout will result in additional fee. Some of these changes are available for an additional fee. Contact me BEFORE purchasing if you have any questions regarding color changes and fees. This PDF file is password protected. The password is in the PDF Instructions. Colors may vary slightly from the images shown. Since devices, computers and displays can vary greatly and be calibrated differently, all colors viewed online and digitally should be considered approximate. If you have questions or would like any assistance with an order, please contact me at hello@cutemuse.com. I will be happy to help you! All designs are for personal use only and cannot be resold, shared, forwarded or redistributed. Cute Muse retains all rights. Subscribe to www.cutemuse.com/blog for updates and freebies.